Received: March 27, 2017; Revised: May 2, 2017; Accepted: May 3, 2017; Published online: November 30, 2018. Clozapine may be associated with cardiovascular adverse effects including QTc prolongation and, more rarely, with myocarditis and pericarditis. Although rare, these latter cardiovascular adverse effects may be life-threatening and must be immediately recognized and treated. Several cases of clozapine related-pericarditis have been described and often it has a subtle and insidious onset with symptoms that may be often misdiagnosed with psychiatric manifestations (e.g. anxiety, panic or somatization) leading to a delayed correct diagnosis with potential fatal consequences. In the present report we describe the case of a 27-year-old girl with schizoaffective disorder taking long acting aripiprazole and valproate who developed a sudden onset clozapine-related pericarditis during titration phase that resolved with immediate clozapine discontinuation and indomethacin administration. We underline the importance of an early diagnosis of clozapine-related pericarditis and the need to have monitoring protocols to prevent this potentially fatal adverse effect especially when polypharmacy is administered to patients taking clozapine. In the present case report we describe the case of a sudden onset clozapine-related pericarditis during titration phase in a patient taking long acting aripiprazole and valproate. A 27-year-old girl was diagnosed with schizoaffective disorder at age of 19 years and previously treated with haloperidol and, after, risperidone and valproate with small clinical improvement and development of adverse side effect (i.e., parkinsonism). Risperidone was gradually tapered off and long-acting aripiprazole 400 mg once monthly (OM) was added to her regimen with mild improvement and disappearance of parkinsonism. However, she was voluntarily admitted in half October 2016 in psychiatric ward of Teramo (Italy) due to a clinical picture characterized by persistence of affective flattening, reduced ability to plan or carry out activities, mild agitation and moderate elevated/irritable mood in conjunction with persecutory and grandiosity delusions and moderate disorganization. She was taking long acting aripiprazole 400 mg/day OM (last injection at the end of September), lorazepam 1 mg once daily (OD) and valproate 500 mg twice daily (BID). We decided to add a low dose of clozapine (100 mg BID) jointly with other ongoing treatments. Before starting clozapine analysis of white blood cell count (WBC) and absolute neutrophil count (ANC) was evaluated and was within normal limits. Other routine blood analyses were normal (including B-type natriuretic peptide [BNP], troponin and C-reactive protein [CRP]) as well as electroencephalogram, electrocardiogram and echocardiography. Clozapine was initiated following drug data sheet and slowly titrated after six days up to 100 mg/day, without significant side effects. At the eight day, following a routine monitoring based on a protocol developed by us from Ronaldson et al.6) for clozapine-related myocarditis, we found an increase of CRP (30.03 mg/L, range 0–5 mg/L), troponin (30.03 pg/ml, range 0–14 pg/ml) and creatinkinase (CPK, 455 U/L, range 20–170 455 U/L). BNP was normal (5.0 pg/ml, cutoff <14) as well as blood cell count. Electrocardiogram showed only a sinus tachycardia (121 bpm). However, the patient was almost asymptomatic and complained (only from the night before blood samples) of mild shortness of breath (that patient attributed to “anxiety”) and mild elevation in body temperature (37°C). No other symptoms were reported. We immediately executed an echocardiography (Fig. 1) that documented an hyperkinetic cardiac activity with a preserved ventricular kinetic without dilatation. However, in the right ventricle, mild pericardial effusion was documented without cardiac tamponade or myocardial dysfunction, a clinical picture leading to the hypothesis of clozapine-related pericarditis. Clozapine was immediately discontinued and, following cardiologist recommendation, she was initiated with indomethacin 50 mg per oral BID, maintaining valproate 500 mg BID. After five days a new blood routine showed a normalization of CRP, CPK and troponin. As well, a new echocardiography documented the reversal of pericarditis. The patient was after discharged with the addiction of quetiapine 50 mg. The last observation was made in March 2017; the patient was taking long acting aripiprazole 400 mg/day OM (last injection at the end of February), lorazepam 1 mg OD, quetiapine 50 mg/day and valproate 500 mg BID without adverse effects and good improvement. WBC and ANC were within normal limits as well as electrocardiogram, CRP, CPK and troponin. The patient provided informed consent to present this report. There is only one report that has investigated the long-acting aripiprazole/clozapine combination in a case of ultra-resistant schizophrenia without insurgence of adverse effects.13) However, in our case, we cannot exclude that this combination may have contributed to cause the observed clozapine-related pericarditis. Moreover, even it has been suggested that valproate-clozapine association may cause eosinophilic effusion,14) we excluded a role of valproate on the matter, because this latter was unaltered for years and any clinically significant pharmacokinetic interaction between these two drugs is likely to happen.15) However, it is worthy to note that, in most cases, antipsychotic and/or other psychotropic polypharmacy may increase the risk of clozapine-related pericarditis and myocarditis2,16,17) and, therefore, a greater attention must be the rule in such cases even in asymptomatic patients. Clozapine-related myocarditis was also excluded since echocardiography, cardiac necrosis markers and brain natriuretic peptide were all negative. Clozapine was a definite causative agent (score of 9) according to the Naranjo probability scale,18) which evaluates single-drug adverse events. Therefore, we suggest that electrocardiogram, CRP, troponin T, and cardiac ultrasound records should be considered before clozapine introduction and during its titration phase, especially in the case of concomitant treatments (such as, in this case, long-acting aripiprazole and valproate), even if the patients is relatively asymptomatic. This case underlines the importance of early diagnosis of clozapine-related pericarditis and the need to have monitoring protocols to prevent this potentially fatal adverse effect especially when polypharmacy is administered. Fig. 1. 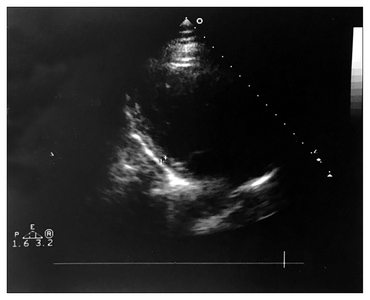 Echocardiography documenting a mild pericardial effusion in the right ventricle without cardiac tamponade or myocardial dysfunction. Curto, M, Girardi, N, Lionetto, L, Ciavarella, GM, Ferracuti, S, and Baldessarini, RJ (2016). Systematic review of clozapine cardiotoxicity. Curr Psychiatry Rep. 18, 68. De Berardis, D, Campanella, D, Serroni, N, Rapini, G, Olivieri, L, and Fornaro, M (2014). Clozapine-related pericarditis during titration phase in a patient with resistant schizophrenia and concomitant valproate treatment: a case report. J Clin Psychopharmacol. 34, 649-651. De Berardis, D, Serroni, N, Campanella, D, Olivieri, L, Ferri, F, and Carano, A (2012). Update on the adverse effects of clozapine: focus on myocarditis. Curr Drug Saf. 7, 55-62. Paul, I, Basavaraju, V, Narayanaswamy, JC, and Math, SB (2014). Clozapine-induced pericarditis: an overlooked adverse effect. Clin Schizophr Relat Psychoses. 8, 133-134. Rathore, S, Masani, ND, and Callaghan, PO (2007). Clozapine-induced effuso-constrictive pericarditis. Case report and review of the literature. Cardiology. 108, 183-185. Ronaldson, KJ, Fitzgerald, PB, and McNeil, JJ (2015). Clozapine-induced myocarditis, a widely overlooked adverse reaction. Acta Psychiatr Scand. 132, 231-240. Markovic, J, Momcilov-Popin, T, Mitrovic, D, Ivanovic-Kovacevic, S, Sekuli, S, and Stojsic-Milosavljevic, A (2011). Clozapine-induced pericarditis. Afr J Psychiatry (Johannesbg). 14, 236-238. Layland, JJ, Liew, D, and Prior, DL (2009). Clozapine-induced cardiotoxicity: a clinical update. Med J Aust. 190, 190-192. Körtner, K, Neuhaus, AH, Schürer, F, and Dettling, M (2007). Eosinophilia indicating subclinical clozapine-induced pericarditis. J Clin Psychiatry. 68, 1147-1148. Prisco, V, Monica, P, Fiore, G, Tridente, A, La Rocca, A, and Catapano, F (2016). Brain natriuretic peptide as a biomarker of asymptomatic clozapine-related heart dysfunction: a criterion for a more cautious administration. Clin Schizophr Relat Psychoses. Crews, MP, Dhillon, GS, and MacCabe, JH (2010). Clozapine rechallenge following clozapine-induced pericarditis. J Clin Psychiatry. 71, 959-961. Manu, P, Sarpal, D, Muir, O, Kane, JM, and Correll, CU (2012). When can patients with potentially life-threatening adverse effects be rechallenged with clozapine? A systematic review of the published literature. Schizophr Res. 134, 180-186. Sepede, G, Di Iorio, G, Spano, MC, Lorusso, M, Sarchione, F, and Santacroce, R (2016). A case of resistant schizophrenia successfully treated with clozapine/long-acting injectable aripiprazole combination. Clin Neuropharmacol. 39, 322-324. Fernández-Pérez, R, Alvarez-Dobaño, JM, Suárez-Antelo, J, Codesido-Barcala, R, Carballal-Calvo, F, and Arrojo-Romero, M (2009). Eosinophilic pleural effusion associated with the addition of sodium valproate. J Clin Psychopharmacol. 29, 310-311. Facciolà, G, Avenoso, A, Scordo, MG, Madia, AG, Ventimiglia, A, and Perucca, E (1999). Small effects of valproic acid on the plasma concentrations of clozapine and its major metabolites in patients with schizophrenic or affective disorders. Ther Drug Monit. 21, 341-345. Presecki, P, Grosić, V, Silić, A, and Mihanović, M (2010). Infection or idiosyncratic reaction to antiepileptic drugs?. Psychiatr Danub. 22, 132-134. Cadeddu, G, Deidda, A, Stochino, ME, Velluti, N, Burrai, C, and Del Zompo, M (2015). Clozapine toxicity due to a multiple drug interaction: a case report. J Med Case Rep. 9, 77. Naranjo, CA, Busto, U, Sellers, EM, Sandor, P, Ruiz, I, and Roberts, EA (1981). A method for estimating the probability of adverse drug reactions. Clin Pharmacol Ther. 30, 239-245.